TURIN, Italy (AP) Juventus closed the gap on Serie A leader Napoli back to just one point as the six-time defending champion eased past Genoa 1-0 on Monday. Douglas Costa scored in the 16th minute, the first conceded by Genoa in five league matches. It was a less than convincing performance from Juventus but it was never really troubled, as goalkeeper Wojciech Szczesny – standing in for the still-injured Gianluigi Buffon – was little more than a spectator. ”What was important was to win,” Juventus coach Massimiliano Allegri said. ”At the end there was a bit of nervousness because we were lacking in energy a bit. The battle for the Serie A title is shaping into a two-horse race. 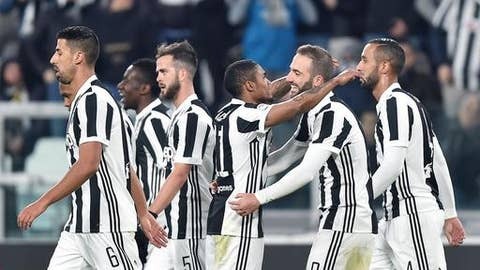 Juventus moved 10 points clear of third-placed Lazio, although the capital side has a match in hand. Allegri’s side started brightly and had an early chance to take the lead but Genoa goalkeeper Mattia Perin did well to keep out a free kick from specialist Miralem Panic.